When tragedy strikes, there are many of us that prefer hiding out and living in the shadows. There are others that decide to come out to the light and shine their own light on us. Being a mother of 4 angel babies, I know what it is to lose an unborn child. It’s painful and you feel like you have no exit. The pain endured is something I don’t wish it upon anyone. If you have dealt with this tragedy, you understand the feelings. Whether it was an unborn child, a stillborn or a child you saw play and cry, going from darkness to seeing the light may become difficult. Some of us decide to do something to be able to move on with your life although you never forget what has happened but you try to live a normal life. With this in mind, I want to introduce you to a strong mompreneur who will talk more about what she is doing now to help her with her grieving. 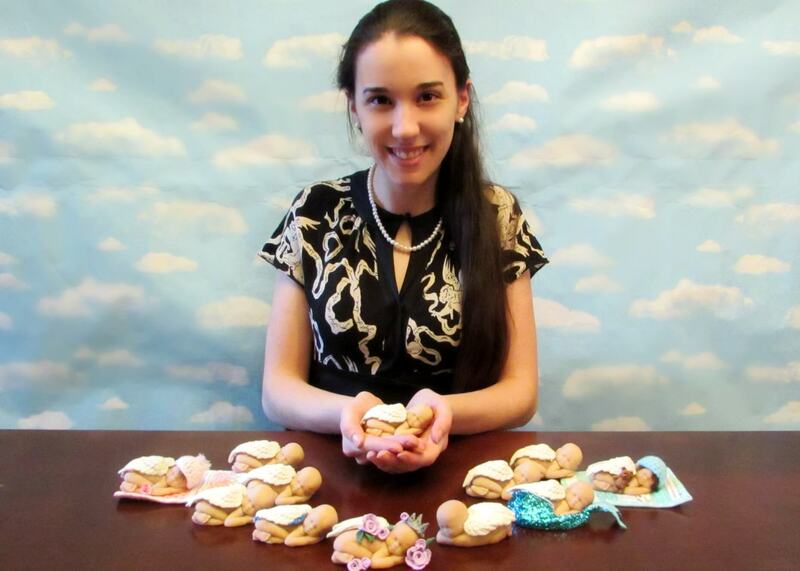 I am Jill Keller, a mother of two beautiful children, both homeschooled by myself, and three angels. I’ve been happily married for nearly seven years. I’ve been a novelist for well over a decade and am beginning to attempt entering the publishing world, but it plays second to the blossoming organization I opened last year. For as long as I can remember, I’ve been passionate about two things: writing and crafting. As I’ve gotten older, my love for them has grown and I’m thrilled to be actually doing something with both of these dreams. I’m definitely an introvert. I’ve been teaching myself for years how to come out of my shell and open up, as it’s so important for running my business, but I will definitely always have introverted tendencies that I love too much to change. It’s part of what led me to become so good at what I do! Tell us about your products? I make angel sculptures for my Angel of Mine organization. I created a charity portion of the organization so that any parent grieving a miscarriage, stillbirth, or baby loss could get an angel comfort package. I opened the store in April of 2016, which is what funds the charity and allows me to get really creative with people’s custom orders. These custom made per order angels are made to bring comfort and healing to those in grief, something unique and completely done for their specific angel. My husband and I do this together as an act of service to our own three angels in their names, and to help those who are going through the same pain as we are. How did you come about this idea? 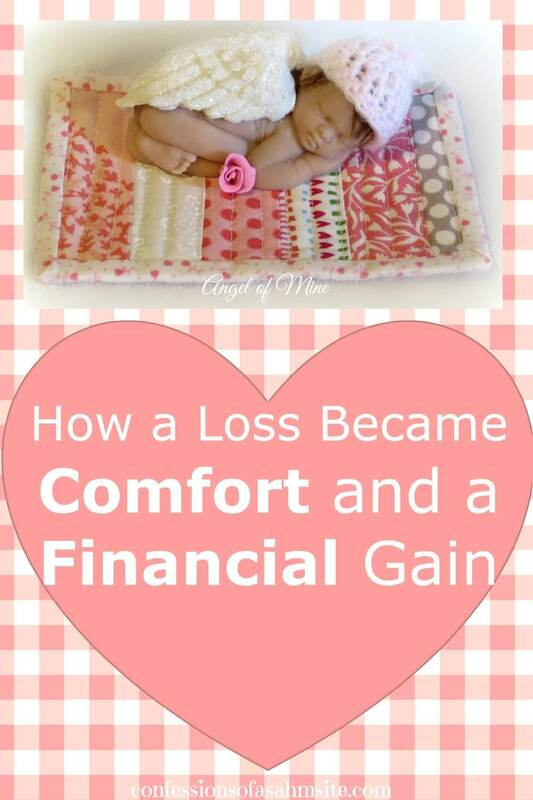 In 2013, we lost our second daughter in an early second tri loss. I immediately felt a need to reach out and be part of something healing. I joined with some charities to keep my hands busy. I made dozens and dozens of tiny hats for an organization and hospitals for parents suffering miscarriages or stillbirths to hold and remember their baby by. In 2016, we lost a twin pregnancy along with my fertility. It was devastating. I fell into a difficult depression. Again, I wanted to reach out to charities to lend my services, but sadly, I found that the organizations I had helped before had shut down and there was little still open that were offering their services or needed help. I felt a great need to have something that beautifully represented my twins. I instantly had an image in my head and I chased it down. I wanted something realistic and perfect, something I could hold in my hand. When I was in the hospital losing the twins, my husband had searched the gift shop trying to find something for me to cuddle to help, but everything said Congratulations or Get Well. I wanted something for my own situation. I couldn’t find it anywhere. I searched the entire internet and nothing came close to my vision, so I set out to make my own. Once I did, it was perfect. I instantly fell in love with them. It helped so much to hold these two little angels in my hand. It was such a comfort, I decided to not keep it to myself. I quickly came up with an idea on how to make them on a national and then global scale so I could help others who were in search of the same need. I already had the idea and some of the materials, I just needed a plan to get the same materials on a much larger scale. At the time, I had been in the hospital for 3 weeks and my husband had been off work to care for our children and myself who was in recovery from surgery. We were in a really bad place financially. We could barely afford the materials to make the two babies we had, there was no money to spare. So it became a staged plan on how to launch the organization that had grown so close to my heart and was helping to lead me out of my depression with the idea of helping others. My husband and I spent many late nights making pricing lists and plans for the following months. What was your startup costs? If you recall. Once all of the materials were gathered to start the business, it had cost a few hundred dollars. I don’t remember the exact amount, but there were so many little things I hadn’t calculated at the beginning that became essential. I started my business about $300 in debt and became more in debt for the first few months of operating as I needed more and more. I launched the Angel of Mine store on April 28th, 2016, so about eight months. I’ve self-taught myself almost every craft I do and this was no different. I spent a few months learning from trial and error, attempting to perfect the product. It was quite a costly learning experience, but I think it makes any craft a little more special when it’s so hard earned and figured out by trial. I originally started out with the idea that I’d only make three types of angels: A girl version, a boy version, and a gender neutral version. But the more requests I got, the more I fell in love with ideas of different styles. 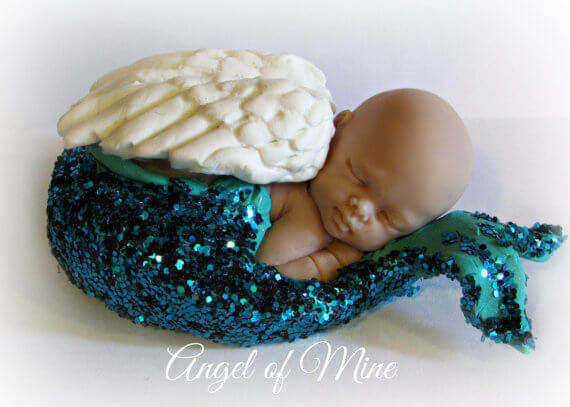 I once got a special request to make an angel as a mermaid in honor of a baby who had Sirenomelia. I had so many people fall in love with it that I kept it on. I had many people who asked for special colored flowers, or teddy bears, birthstones or personalizations. The angels offered just kept growing based on what I heard people wanted most. 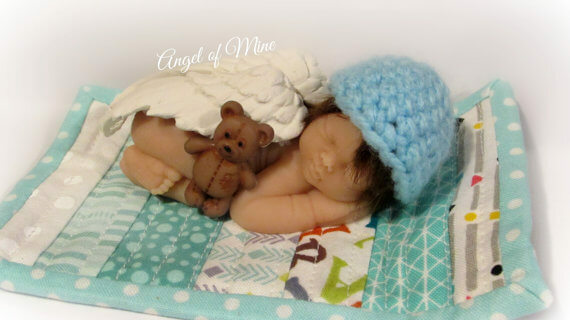 I also love making special, one of a kind angels with different items that fellow crafters donate to the organization, such as custom handmade quilts sized just for my angels. Trust yourself. There’s going to be many times when your business path forks and it’s all up to you to figure out which way to go. Remember that you don’t have to race through every decision or grow as fast as you can. You just have to keep quality, remember why you started, and to trust yourself to know what’s best for your own business. Very carefully! I always hated the idea of a schedule. They bored me to tears. I thought it would be too predictable. But now that I’m trying to write and publish novels, expand the organization while balancing the two financially and still have time to homeschool my kids, run them around to their activities and keep up the house, a schedule is desperately needed. While it’s still a struggle, it’s not nearly as boring as I always feared! As your heart unswells from the pain and suffering of losing a child, comfort can be found in the most unexpected places. 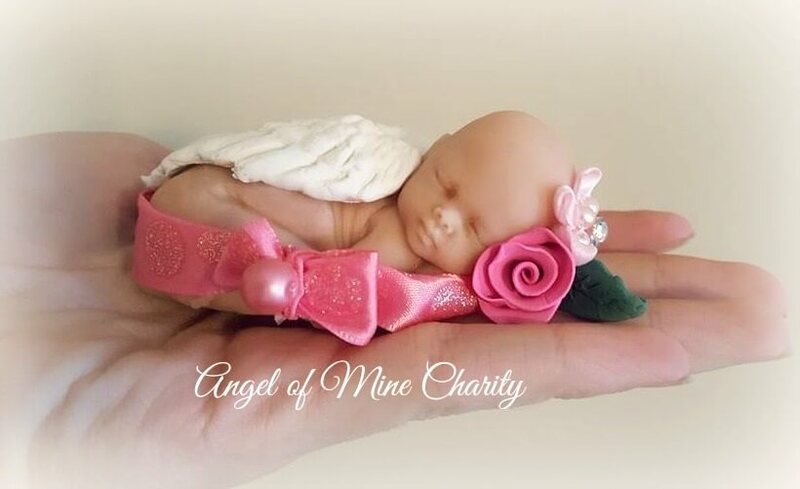 Love and care for the little soul that has gone to meet his Creator, arrives this beautifully sculpted figurine that will be held and treasured as if your baby was with you, Angel of Mine’s creations. If you have endured this tragic experience, this is a little piece of heaven that can help you cope with your loss. Although nothing will ever replace what you feel for your little angel, it can bring some comfort knowing that your angel is safe in His hands. P.S. If you know or are someone who has endured this pain, maybe a little beautifully made sculpture will at least bring you some comfort. If you feel like donating or contributing with your purchase, check out Angel of Mine’s Etsy store to find the right angel for you or ask for a custom creation from Jill, as she loves custom requests. Beautiful post of Love and Healing….thank you for sharing! Thank you for reading and commenting Shauna! I loved this story. Beautiful testament of following our heart and making something that was painful into something positive.